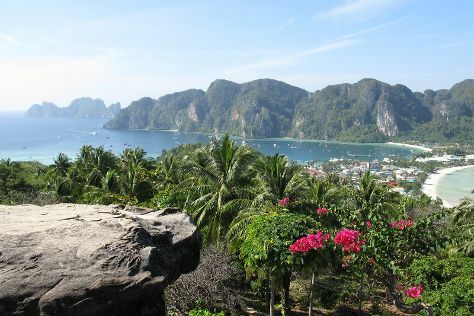 Find your inner peace on Ko Phi Phi Don, the largest island in the eponymous archipelago. The attractive limestone island offers a wealth of outdoor activities, such as rock climbing, caving, and inland hiking, while the surrounding marine environments provide an array of dive spots and snorkeling sites ideal for active Ko Phi Phi Don holidays. Enjoy the pleasant sandy beaches of the main island, and take a trip out to the uninhabited landmasses of the archipelago to explore areas rarely visited by foreign tourists. Ko Phi Phi Don is in Krabi Province. With the Inspirock online itinerary creator, Ko Phi Phi Don and other destinations across the globe can be made central to your personalized travel plans.